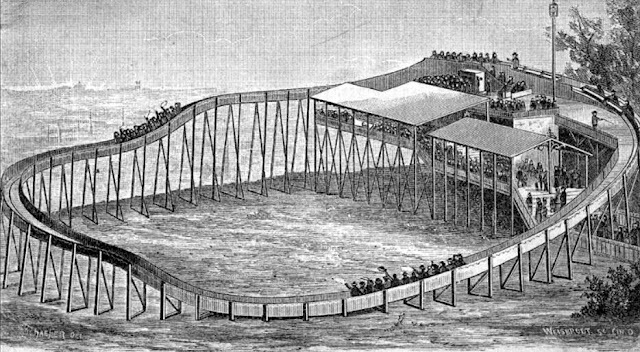 CHICAGO'S STATE STREET PARK, aka: "THE ROLLER COASTER"
Illustration of Patent № 298,710 "Roller Coasting Device" granted on May 13, 1884. 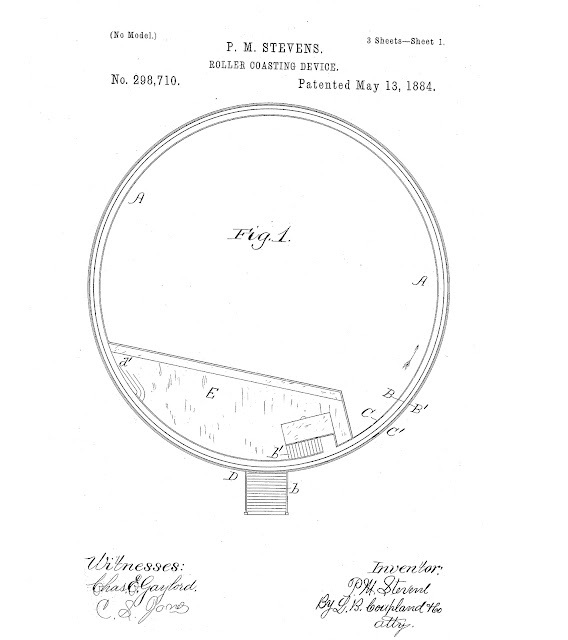 Alason Wood's invention was noticed and imitated by several other Toledo Ohio inventors and businessmen, like Philo M. Stevens who traveled to Chicago to build a circular railway with a slightly modified design. The Chicago Daily Tribune reported on September 30, 1883 that his 22-foot-high, 140-foot-diameter circular railway was under construction at a cost of $800 on a large vacant lot at the corner of State and 22nd Street in today's South Loop community. The reporter misspelled his name as Philo M. Stevenson. The grounds used to be called "State Street Grounds" aka: "23rd Street Grounds" which was a baseball park. In it, the Chicago White Stockings played baseball from 1872 to 1877, the first two years in the National Association and then in the National League. 23rd Street Park - The First Home of the Chicago White Stockings. 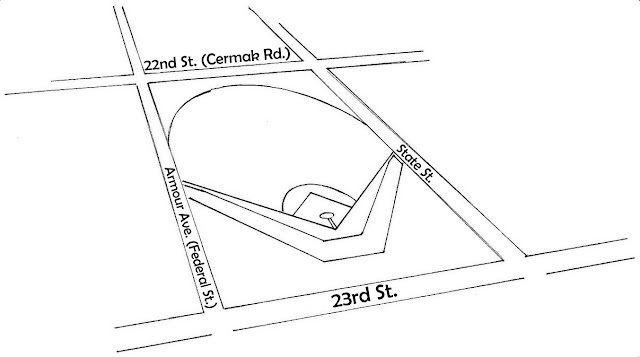 The park grounds was on the block bounded by 22nd Street (now Cermak Road), State Street, 23rd Street, and Armour Avenue (now Federal Street). 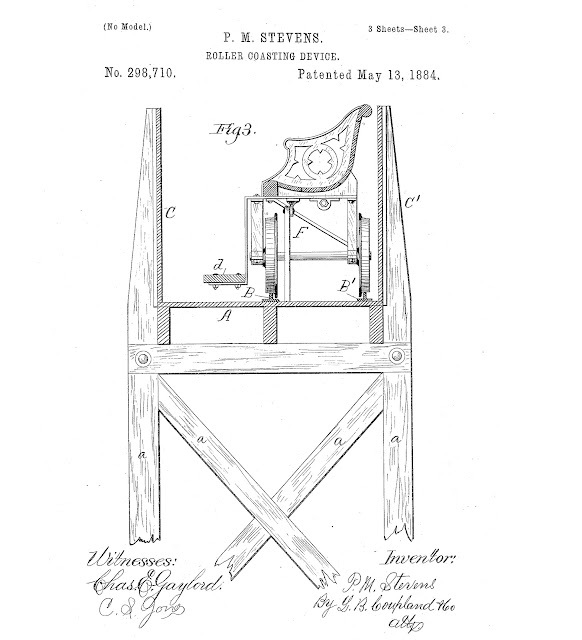 The design, according to the patent he applied for on October 16, 1883, was nearly identical to Wood's, but had a constant slope down, and a constant slope up. The car, which stopped at the end of the uphill grade, was held in place by an anti-rollback pawl. The two-car trains could accommodate 6-9 passengers seated sideways in each car, and Stevens offered three short 15-18 second rides for a nickel. 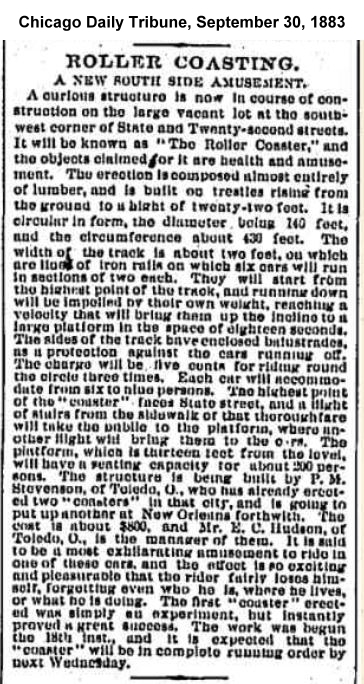 The newspaper article claimed that Stevens had already built two coasters in Toledo, and would built one shortly in New Orleans. 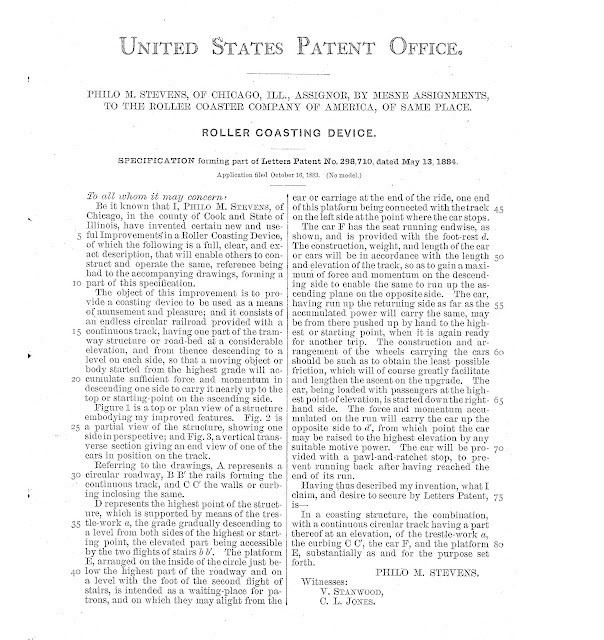 His patent #298,710 Roller Coasting Device was granted on May 13, 1884, and assigned to the Roller Coaster of America Company; thus where the generic name roller coaster originated. 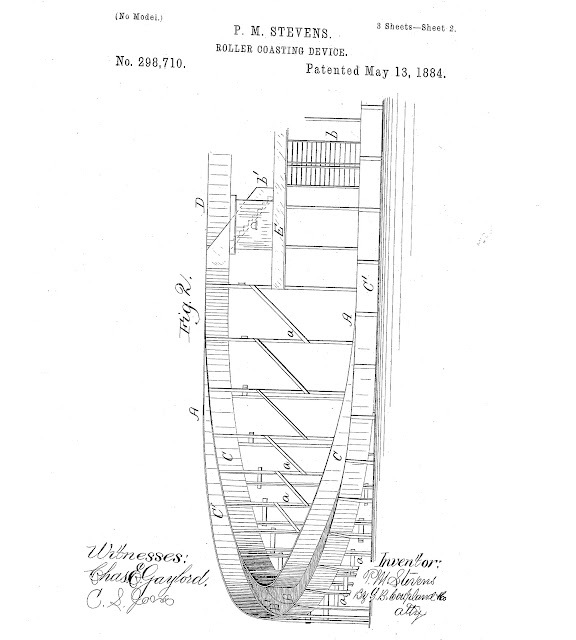 Alason Wood was the first to be granted a patent for a circular railway with series of undulating drops after the lift hill. This was a radical departure from the lineage of switchback railway design, but considering that Wood was unfamiliar with those convoluted designs, his approach was novel in that it returned its passengers to near its starting point without the need of a separate return track. Wood was a dirt poor carpenter, but a born tinkerer, who after watching children slide down hills on their slide boards, was inspired to design a railroad whose cars could travel both up and down hills. He envisioned a ride that would thrill its passengers with speed, rather than take them for a slow scenic ride. His innovation was to bend the rails into a circle, allow the passenger car to roll down the incline from a height, and use the ride's final uphill incline as a brake on the car's momentum, thus eliminating the need for friction brakes to bring it to a final stop. By logically tying the two ends of his tracks together into a continuous elliptical loop, he returned passengers to their starting point without the inconvenience of awaiting a return train or the interruption of a mildly exciting ride. 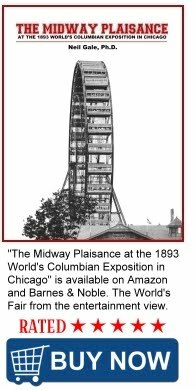 His wood-framed ride had a height of 23 feet, diameter of 150 feet, and a circumference of 475 feet. A platform 13 feet above ground, where passengers debarked, had a seating capacity of 200 for those awaiting their turn. Passengers walked up the stairs to the loading platform, while pairs of cars each seating six sideways on a long bench were winched up a nine-foot-high incline. It was a short exhilarating downhill ride over a series of undulating hills, only ten to twelve seconds from start to finish, but passengers could ride it three times for their nickel. Wood's patent was quite detailed in the various slopes of his ride. The cars gained speed down a 15% grade, a drop of just 6 feet over 48 feet of track, then only dropped two additional feet along the next 167 feet before reaching the next 15% down-grade along 64 feet of track, then finally down to the bottom, a two foot drop along 53 feet of track. The car's speed was arrested as it climbed a 15% grade of 9 feet over a 72 foot distance, and then glided into the unloading station along 22 feet of level track. Wood sold half his pending patent to Joseph A. Cahoon, a businessman in Toledo for $17,000 plus royalties. Cahoon saw its potential as an amusement ride, and since he could recover the ride's construction cost of $600 within a several weeks at most, he and several associates began construction, first in Toledo and possibly Cleveland in 1883. They then built in Ponce de Leon Springs in Georgia as reported by the Augusta Chronicle, and Coney Island, NY in June 1884, and at Philadelphia's Fairmont Park in July 1884. Chicago's First Roller Skating Rink.